This book attacks the conventional wisdom that bureaucrats are bunglers and the system can't be changed. 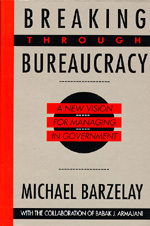 Michael Barzelay and Babak Armajani trace the source of much poor performance in government to the persistent influence of what they call the bureaucratic paradigm—a theory built on such notions as central control, economy and efficiency, and rigid adherence to rules. Rarely questioned, the bureaucratic paradigm leads competent and faithful public servants—as well as politicians—unwittingly to impair government's ability to serve citizens by weakening, misplacing, and misdirecting accountability. How can this system be changed? Drawing on research sponsored by the Ford Foundation/Harvard University program on Innovations in State and Local Government, this book tells the story of how public officials in one state, Minnesota, cast off the conceptual blinders of the bureaucratic paradigm and experimented with ideas such as customer service, empowering front-line employees to resolve problems, and selectively introducing market forces within government. The author highlights the arguments government executives made for the changes they proposed, traces the way these changes were implemented, and summarizes the impressive results. This approach provides would-be bureaucracy busters with a powerful method for dramatically improving the way government manages the public's business. Generalizing from the Minnesota experience and from similar efforts nationwide, the book proposes a new paradigm that will reframe the perennial debate on public management. With its carefully analyzed ideas, real-life examples, and closely reasoned practical advice, Breaking Through Bureaucracy is indispensable to public managers and students of public policy and administration. Michael Barzelay is Associate Professor of Public Policy at the John F. Kennedy School of Government, Harvard University, and the author of The Politicized Market Economy (California, 1986). Babak J. Armajani served as an executive in the Minnesota state government from 1983 to 1991 and is currently a Senior Fellow at the Humphrey Institute of Public Affairs, University of Minnesota.